A fantastic lost slice of work from Glen Campbell – recorded in the studio during the years of his big initial fame in the 60s – but never issued to the public at all! 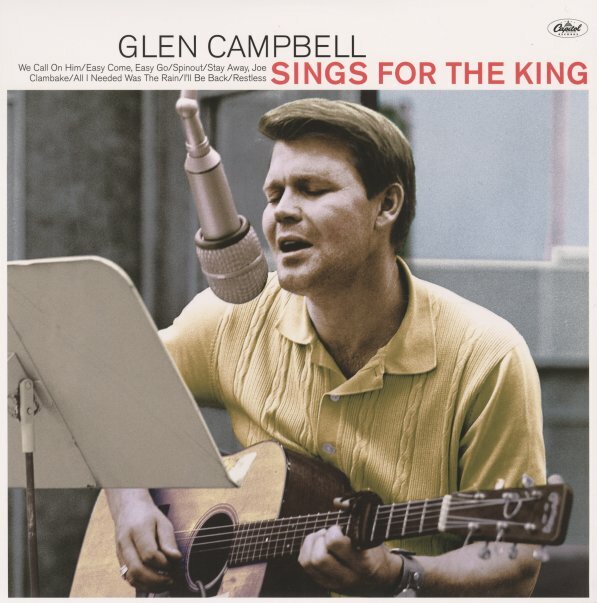 Instead, these tracks were recorded for "The King" – that is, Elvis Presley – a bit like demos of tunes that the songwriters wanted Elvis to sing – but handled by Campbell in initial readings that sometimes echo the style of Presley, sometimes have Glen bringing more of his own spirit to the songs. All the titles were written by Sid Wayne and Ben Weisman – the latter of whom gave Elvis plenty of hits in the 60s – and the album's not just a great view at a lost slice of 60s rock, but also a fantastic testament to the diversity and strength of the young Glen Campbell working in LA. Titles include "Magic Fire", "I'll Be Back", "I Got Love", "Anyone Can Play", "Spinout", "Do The Clam", "Stay Away Joe", "Love On The Rocks", "Easy Come Easy Go", "How Can You Lose What You Never Had", and "All I Needed Was The Rain" – plus a rare duet with Elvis on "We Call On Him". © 1996-2019, Dusty Groove, Inc.